As a thank you for your amazing feedback so far we are giving you the chance to win an 1TB Xbox One or PlayStation 4. To be in with a chance of winning simply head over to our Facebook page and like and share the competition post. The terms and conditions for the competition can be found below. The Competition is being promoted and operated by RailSimulator.com Limited T/A Dovetail Games (“Dovetail”). The Competition is open to anyone aged 16 and over except Dovetail employees, and anyone Dovetail deems to be connected with the Competition (“Entrants”). Each Entrant consents to Dovetail sending them news and marketing about Dovetail Games Fishing products. The Competition will run for a period of fifteen (15) days opening at 7:00pm BST on 18th October 2018 and closing at 12pm BST on 2nd November 2018 (“Closing Date”). After the Closing Date, one (1) Competition winner will be selected based on the criteria set out in clause 10. 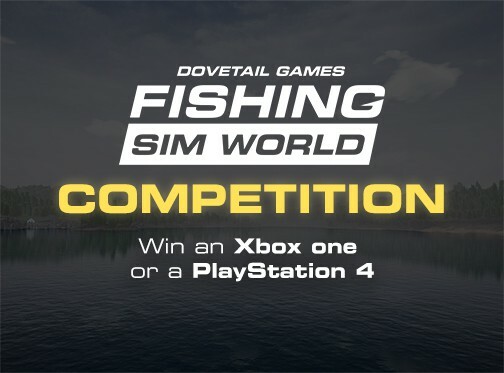 Entrants should like the Facebook post and Facebook pages for Dovetail Fishing to be entered into the competition. Entries must be made prior to the closing date. Only one (1) entry will be permitted per person regardless of method of entry and bulk entries (meaning the use of any form of technology which allows multiple simultaneous entries) will not be permitted. Entries on behalf of another person will not be accepted. No responsibility is taken for entries that are lost, delayed, misdirected or incomplete or cannot be delivered for any technical or other reason. Entries received after the Closing Date will not be considered. Entries cannot be returned. One (1) winning entrant (“Winner”) will be selected by a Dovetail employee decided at random from all entries. Dovetail Games decision shall be final and no correspondence shall be entered into in respect of such decision. The Winners will be notified within seven (7) days of the Closing Date using the details provided by them on entering the Competition. If the Winner is unable to be contacted within seven (7) calendar days of the Closing Date of the Competition, Dovetail reserves the right to offer the prize to a runner-up, or to re-offer their prize in any future Dovetail competition. The Winner will be given the choice of a 1TB Xbox One or 1TB PlayStation 4. There is no cash alternative and the prizes will not be transferable. Dovetail accepts no responsibility for any costs associated with the prizes and not specifically included in the prize. If the prize is unavailable, for whatever reason, Dovetail reserves the right to substitute the prize for a prize of equal or greater value. The substituted prize shall be at Dovetail’s sole discretion. The name and place of residence of the Winner may be obtained by sending a self-addressed envelope to: Fishing Business Director, RailSimulator.com Limited T/ Dovetail Games, The Observatory, Chatham Maritime, Chatham, Kent, ME4 4NT, United Kingdom, within two (2) months of the closing date of the Competition. Any promotional activity or press release the Winner makes in relation to the Competition must be pre-approved by Dovetail in writing. Dovetail excludes liability to the full extent permitted by law for any loss, damage or injury occurring to the participant arising from his or her entry into the Competition or occurring to the Winner or a runner-up arising from his or her acceptance of a prize. Dovetail excludes liability to the full extent permitted by law for any loss, damage or injury occurring to the participant arising from his or her entry into the Competition or occurring to the Winner or arising from his or her acceptance of a prize. Dovetail reserves the right to amend these Terms and Conditions or to cancel, alter or amend the Competition or the prize at any stage, if deemed necessary in its opinion, or if circumstances arise outside of its control. RailSimulator.com Limited T/A Dovetail Games, The Observatory, Chatham Maritime, Chatham, Kent, ME4 4NT, United Kingdom.